.b29 File extension ransomware uses sophisticated techniques to infiltrate computers and hide from its victims. Use Reimage to determine whether your system is infected and prevent the loss of your files. .b29 File extension virus is a dangerous ransomware related to the Paradise ransomware virus. B29 ransomware, also known as Paradise B29 ransomware, is a new version of the Paradise ransomware. This malicious cryptovirus is using the .b29 file extension to mark valuable victim's data right after encrypting it. After the corruption, a ransom note named #DECRYPT MY FILES#.html is displayed on the victim's screen which aims to announce about the secret infiltration of ransomware virus on the system and files' encryption. 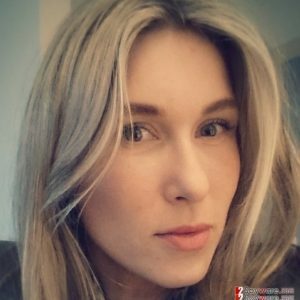 Cybercrooks urge victims to contact them via yourencypter@protonmail.com email address and pay the demanded ransom in Bitcoin to receive a decryption tool for their lost data. The price for files' encryption typically differs. It depends on how fast the victim contacts virus developers and how many files he or she needs to recover. As evidence that files can be decrypted, crooks offer to unlock three files encrypted by .b29 files ransomware. Once inside the system, Paradise B29 ransomware also creates several registry entries in the victim's computer in order to perform its hazardous activity. Data is encrypted by using unique codes. All keys are stored on external servers and are almost impossible to discover. Be careful and better avoid any contact with the criminals. According to malware experts from NoVirus.uk, victims usually are tricked into paying a big price and left with a broken promise. 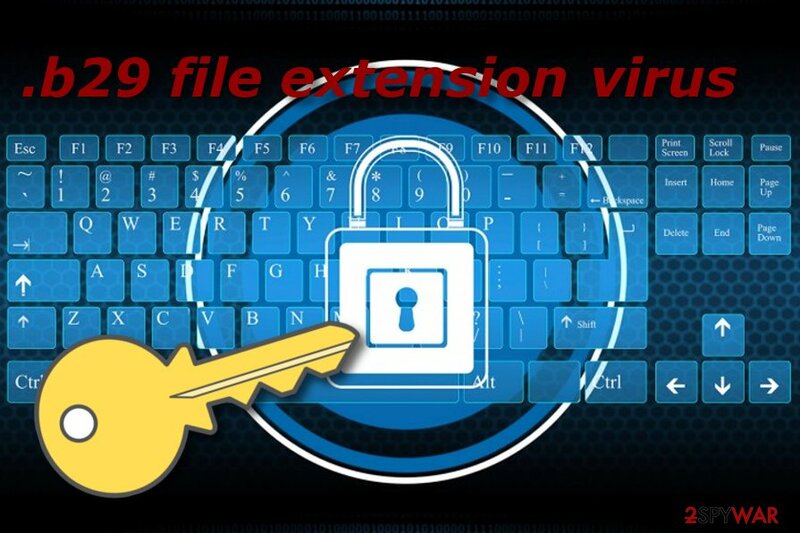 What you should do is remove .b29 File extension virus from your PC system as quickly as possible. For such purpose use Reimage or any other similar professional anti-malware tool. You spot unrecognizable changes in the Windows Registry. Paradise B29 - a sneaky cryptovirus which infiltrates the system unknowingly and starts its hazardous activity by modifying the Windows Registry. According to research, ransomware often distributes thru dubious spam messages which are sent from the cybercrooks straightly to victims' emails. In some cases, they might come legitimate-looking. There might be an attachment clipped to the letter or a link inserted inside. DO NOT open such content as it might contain a harmful infection. Get rid of all spam emails you receive if you are not expecting anything important recently. A good option would be to download and install an antivirus program if you do not already have one running on your computer. Such tools increase the protection highly and secure the system from various threats and infections that might occur along the way. 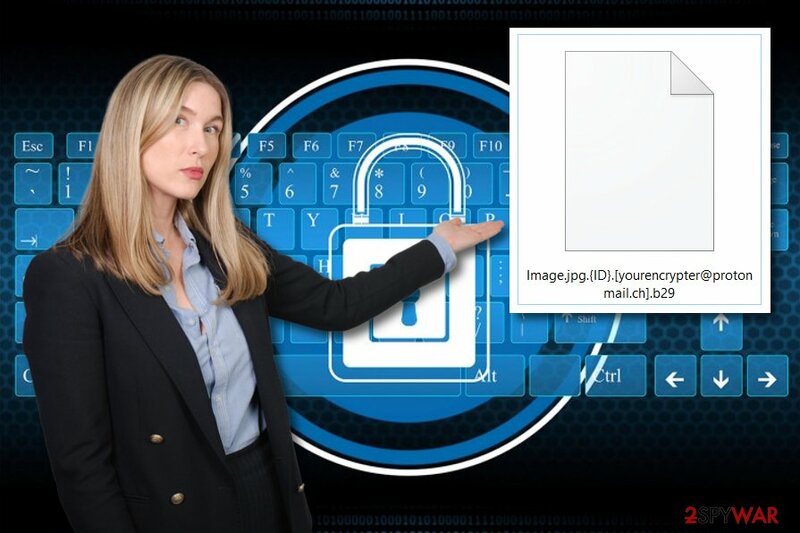 To remove .b29 File extension virus from your computer system, you will need to install anti-malware. We recommend using programs such as Reimage, Malwarebytes MalwarebytesCombo Cleaner, Plumbytes Anti-MalwareMalwarebytes Malwarebytes. Carefully follow the given instructions that will be provided by the tool to perform the full elimination of the virus. If you cannot launch the scanner, you need to reboot your computer to Safe Mode with Networking or reset your machine to the previous data. After you carry out the Paradise b29 ransomware removal, be sure to take care of backups of your most valuable data. For that, you can use external hard drives, could services and similar methods. To recover data that was corrupted by the cyber threat, you can try the following methods for restoring encrypted data. Nevertheless, the best way to do that is to restore your files from backup. Log in to your infected account and start the browser. Download Reimage or other legitimate anti-spyware program. Update it before a full system scan and remove malicious files that belong to your ransomware and complete .b29 File extension removal. When a new window shows up, click Next and select your restore point that is prior the infiltration of .b29 File extension. After doing that, click Next. Once you restore your system to a previous date, download and scan your computer with Reimage and make sure that .b29 File extension removal is performed successfully. Guide which is presented above is supposed to help you remove .b29 File extension from your computer. To recover your encrypted files, we recommend using a detailed guide prepared by 2-spyware.com security experts. Data recovery can be a difficult job but worth trying. Below you will see some methods which might help you in such case. Follow the given instructions and you might be able to recover important data that was deleted, damaged, or corrupted in a certain way. This method might be helpful in data recovery. However, the bad news is that it will not work if you did not activate the System Restore function before the virus managed to spread on your PC. Follow the given instructions. Notice, this method will work only if the ransomware did not manage to erase Shadow Volume Copies of corrupted files. There is no official decryptor yet found. ^ NoVirus. NoVirus. Virus removal guide. ^ iCloud. Wikipedia. The free encyclopedia. ^ Margaret Rouse. Malware (malicious software). Search Security. Tech Target. This entry was posted on 2018-08-10 at 05:12 and is filed under Ransomware, Viruses. You can quickly scan the QR code with your mobile device and have .b29 File extension virus manual removal instructions right in your pocket. How did you remove .b29 File extension virus?